"The B2B plugin offers you 3 must-have tools for your B2B and B2C shop"
Why the B2B Add-ons app? When installing the B2B Add-ons you don’t just add one, not two but three powerful and handy apps to your arsenal to fully streamline your webshop from start to finish. 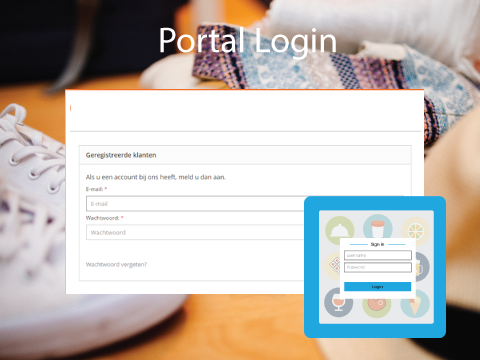 Portal login, this is the new face of your webshop and gives you total control of who may or may not enter your webshop. In combination with the B2B module from Lightspeed, your customers can only see and access your shop when they log in. Exclusive for invited customers. 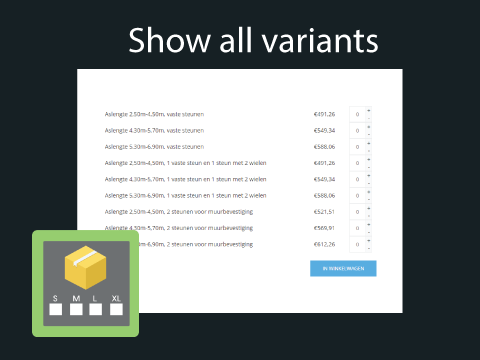 With Show all variants, you let your customers add different variants to the cart, directly from the product page. Customers no longer have the hassle of drop-down menu’s and switching back and forth between product pages and the shopping cart. What is the invoice app? You’ve likely been in this situation before where customers request invoices for orders which they’ve placed years ago. With our invoice app the customers gets full control and insight into their own order history. 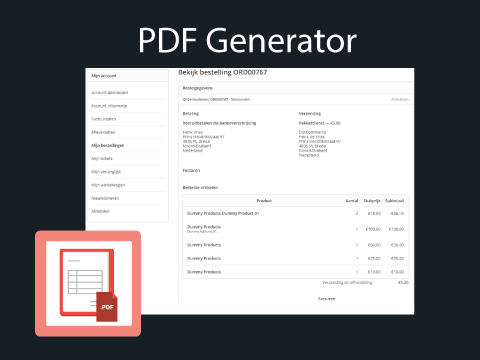 Let your customers directly download/view the invoice from the order page in their account. Portal Login – this app turns your landing page to a login page. Customers are required to log onto your webstore or register a new account. Only logged in users have access to your webstore. Show all variants – This app will show a list of all the available variants on your product page and removes the drop-down menu feature and replaces it with a list. From this list customers can easily specify the amount of variants they need and add it to the shopping cart. No more navigation back and forth between product pages and the shopping cart. Invoice app – This app enables customers to view their own order history and invoices by logging in. No unnecessary loss of time by sifting through a customers entire order history. The B2B Add-ons are 3 seperate add ons. Just interested in one of the 3? No problem, you can install them separately and you can always try one by switching them on and off again. Each feature in this app costs $10 USD. After the trial period you pay a miminum amount of $10 USD. Don't forget to remove the app when you don't want to use it anymore. DotCommerce is an IT company base in Breda (The Netherlands). We are THE partner when it comes down to custom functionality, for both back- and front-end. We like to share some of the amazing stuff we’ve done for our customers with other shop owners on the Lightspeed platform as well, which is why we started offering apps.